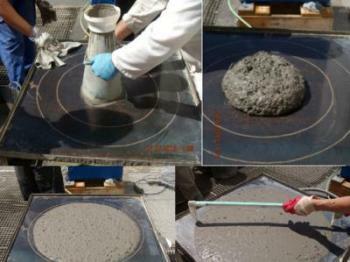 University of Granada researchers have successfully manufactured self-compacting concrete using ash from the combustion of olive pruning residue pellets. Due to its plasticity and cohesion, this type of concrete needs no compaction when used in construction and has many advantages over conventional concrete, resulting in considerable savings of time and money. In an article published in "Construction and Building Materials", the researchers present preliminary results on the use of fly ash, produced in domestic boiler combustion of biomass olive residue pellets, as a substitute for filler in the manufacture of self-compacting concrete. The concrete produced has a compression strength slightly higher than that of conventional concrete and over the minimum required by Spanish Structural Concrete Code EHE-08 (Real Decreto 1247/2008, de 18 de julio). Traditionally, self-compacting concrete is made by mixing standard aggregates, water and cement, with of a fine-grained inert material known as filler and a superplasticizer additive, which improves flowability when the concrete is in its fresh state. Montserrat Zamorano, of the University of Granada Department of Civil Engineering and corresponding author of the paper explains that since the approval of European and Spanish policies to promote the use of renewable energy, biomass energy has been utilized in an ever-increasing range of contexts, bringing with it considerable environmental advantages. "However, in return, combustion implies producing biomass combustion subproducts—ash—which have to be managed in line with the basic waste residue management principles established in European (Directive 98/2008/CE) and Spanish (Ley 22/2011, de 28 de julio, de residuos y suelos contaminados) legislation." Currently, ash is deposited in landfills or used in agriculture. So, increased production of ash means we need to find alternatives, among which we have its application in the construction industry. In this sector, the successful use of fly ash obtained as a residue from coal combustion in thermal and electric power stations is widespread, and has even been regulated. However, this is not the case of olive biomass ash, the focus of this research, which has physical and chemical characteristics that generate very different results to those of traditional ash (basically, due to its inactivity while cement sets and because the particles are finer). Dr Zamorano warns that, given the results of this research, "the use of fly ash biomass as filler in self-compacting concrete is feasible," but a wider-reaching large-scale study is needed to guarantee that the concrete manufactured is of high quality.